College is a time for exploration and growth. Many students fulfill this aspect of college life by studying abroad. However, studying and living in a different country for four to five months is not for everyone. A lack of funds may also hold students back from a study abroad. You may think that you have to put traveling on hold until after graduation, but that is not the case. You can travel while attending Rocky. One of things that Rocky Mountain College does best is give its students countless opportunities. One of those opportunities is traveling, both around the U.S and overseas. Some benefits of traveling with the school are the fact that you are traveling with familiar faces and can earn credits while having a once in a lifetime experience. Plus the costs stay relatively low and affordable for broke college students. 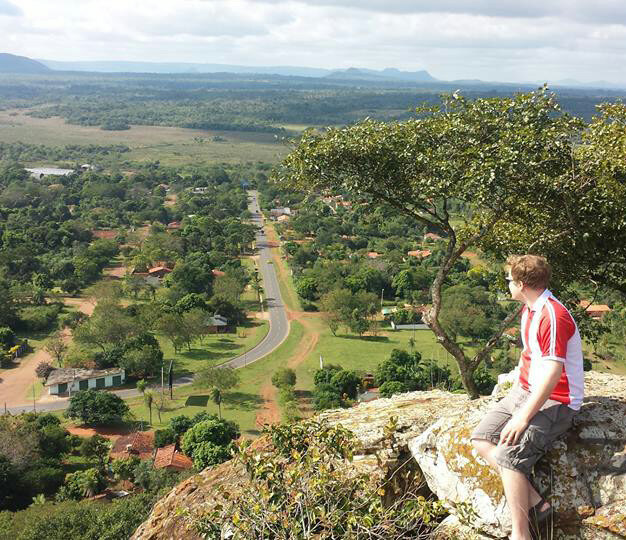 is past semester, Jacob Myers traveled to Paraguay with his environmental science class. The class compared Paraguay’s environmental policies to those of the U.S. The cost was between $3,000 and $3,500. One important thing to keep in mind is that students do not always need to be in the same field of study to travel or take the class that offers the trip. For example, a Creative Writing major can take the Environmental Science class that is traveling abroad. The Environmental Science program is taking another trip this year to Africa. If leaving the country sounds overwhelming, that is perfectly okay. There are trips students have taken that did not involve a passport. Last semester the English class, Writing and Publishing in New York City, traveled to New York for a week and had the privilege of hearing various writers and authors discuss their experiences writing and publishing in New York. The class was taught by Professor Steve Germic. If you are more of a roadtrip type of person, Rocky offers a few options. Montana is a huge state and should be explored by all those who live here. Throughout the school year Outdoor Recreation offers numerous trips to different places in Montana. Students can attend the Red Lodge Christmas Stroll or go up to Big Sky Resort to ski or snowboard. Traveling with Outdoor Rec is a great way to see Montana if you do not have a vehicle or the means to pay for gas. The cost for these trips is usually under $200. Traveling with a class helps students gain a better understanding of cultures. It also exposes students to new experiences, and allows them to learn in a nontraditional setting. If you are interested in traveling with Rocky keep your eyes and ears open. Professors Precious McKenzie and Shelby Jo Long-Hammond are taking students to Ireland and Scotland this spring. Tim Lohrenz, the Director of Outdoor Recreation, has a trip to Hawaii planned for this year. Explore and try new things, you may never have opportunities like this again.